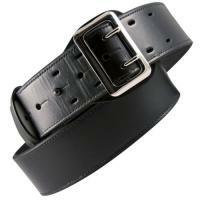 Our all-leather American Value Line Belts really are the best value on the market. They are made from top grain, 8-9 ounce leather. Top grain, 8-9 ounce struck through leather. Available for both duty and off-duty use in a variety of widths. **When selecting size, give your actual waist size. Do not add extra inches for Duty Belts. Great quality for the price. I will buy another one, when its time. The duty belt was just what I would expect from CopsPlus. As always Im very pleased with the item. It is made of good quality leather and I will be using it for many years to come, God willing. P.S. the size is true to your paints size.